Lucy Brushed Cotton Duvet Cover Set is rated 4.8 out of 5 by 20. 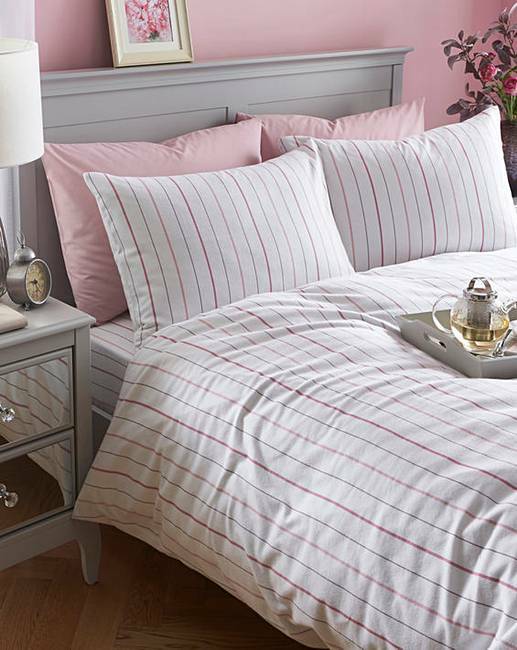 This feminine floral Duvet Cover Set comes in a range of colours and features a stripe reverse. Beautiful and versatile, it is sure to complete the look of any bedroom. Rated 5 out of 5 by Barbara from Lovely material Soft to the touch,never felt anything like it before( feels so cosy). Also very nice pattern. Just washed them so can't wait to sleep in them. delivery was super fast. Other people's reviews helped a lot as well. Very happy customer. Rated 5 out of 5 by John Deed from Brushed cotton duet cover Must say this is one of our best buys for the Winter. The duvet covers are very good indeed. Also as we bought them just over Black Friday we were able to take advantage of the J.D. Williams discounts. Rated 4 out of 5 by Not applicable from Brushed cotton duvet set I bought this in preparation for the colder Winter.weather . So.glad I did , so soft , cosy and warm to snuggle into . The only downside being , you're so comfortable , you don't want to get out of bed in the morning . Rated 5 out of 5 by Splat1972 from Snuggly Really cozy and fitted my king size quilt well, well made.